You can get a mortgage free house in Edmonton if you have $11 and a good enough reason why you deserve to own it. 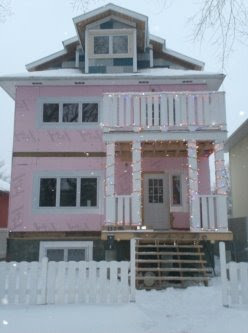 A Edmonton lawyer/investor hopes to cover the cost of renovating a 4 bedroom house by receiving 25,000 entries for a contest to win the previously foreclosed property. It may be an $11 lottery ticket but the chance to win a home mortgage free is a great piece of marketing and a wonderful idea. Visit The 11 Dollar House website and Facebook page. Sorry only residents of Canada can enter! Happy Holidays - Merry Christmas!